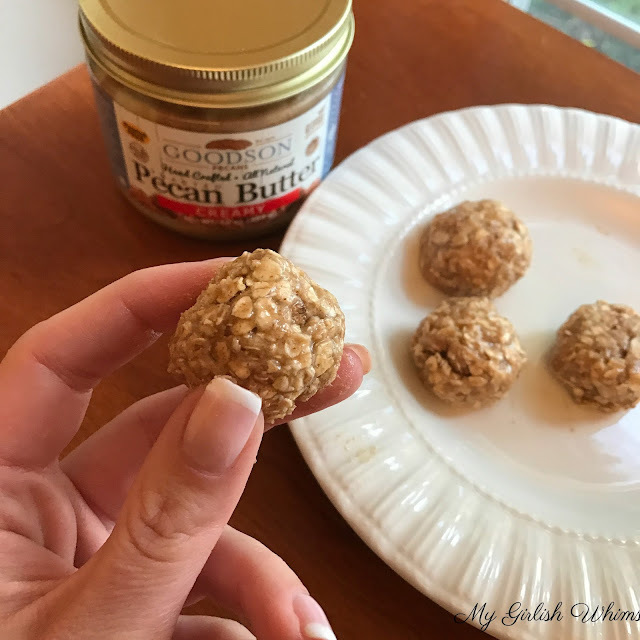 I've been wanting to try a recipe for protein balls for awhile now and I finally had some time this weekend to experiment a bit and try some recipes out! I'm happy to report back that these little balls turned out FABULOUS and I can see myself getting up close and personal with TONS more balls soon. Erm, protein balls I mean. I'm getting protein balls all up in my face is what I mean to say. Is it bad that every time I talk about balls I act like I'm 16 again and try to make slightly inappropriate jokes about them? I did it earlier this month while making turkey meatballs for dinner, every time I go to barre class and the teacher says to "squeeze your blue ball" while we are squatting and working our inner thighs with ball work I snort a little bit to myself...sigh. I think it's time to work on my maturity level a bit. 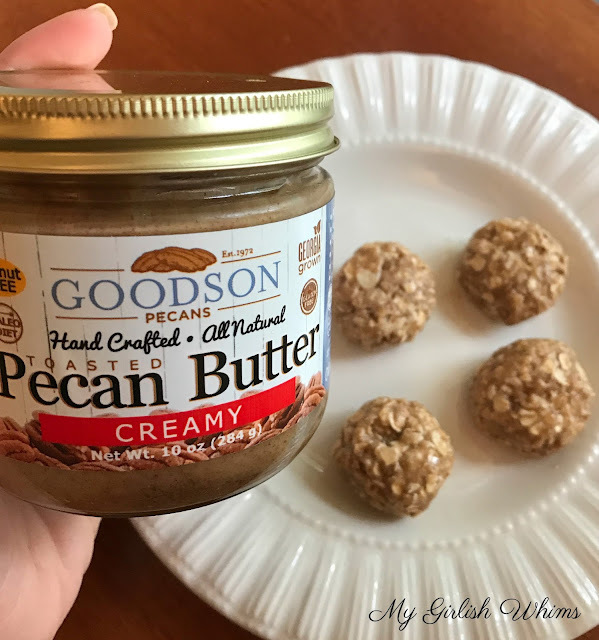 I DON'T have to work hard on this recipe though because it's seriously the easiest thing to make and part of why it's so delicious is because I used a reeeeeeally yummy pecan butter from Goodson Pecans as the nut butter in the recipe. Literally the only two ingredients in the butter are toasted pecans and salt and oh boy. That's all that you need to make some creamy delicious buttah for sure. I whipped this batch up for my dessert Sunday night so I only needed a singled serve version (and I may or may not have only had enough pecan butter left for a single serving because spoonfuls of nut butter are my favorite guilty pleasure to indulge in on the weekend...whoops!) but you can easily double or triple this recipe to make a batch for the week. Just store the balls in the fridge! Thanks for sending me some pecan butter to try Goodson Pecans: (this is not a sponsored post but I was sent the butter c/o) you've gotten me hooked on this protein ball trend and I can't wait to try some more varieties! This recipe makes four protein balls for 54 calories each, 4 grams of carbs, 2 grams of fat and 5 grams of protein each. 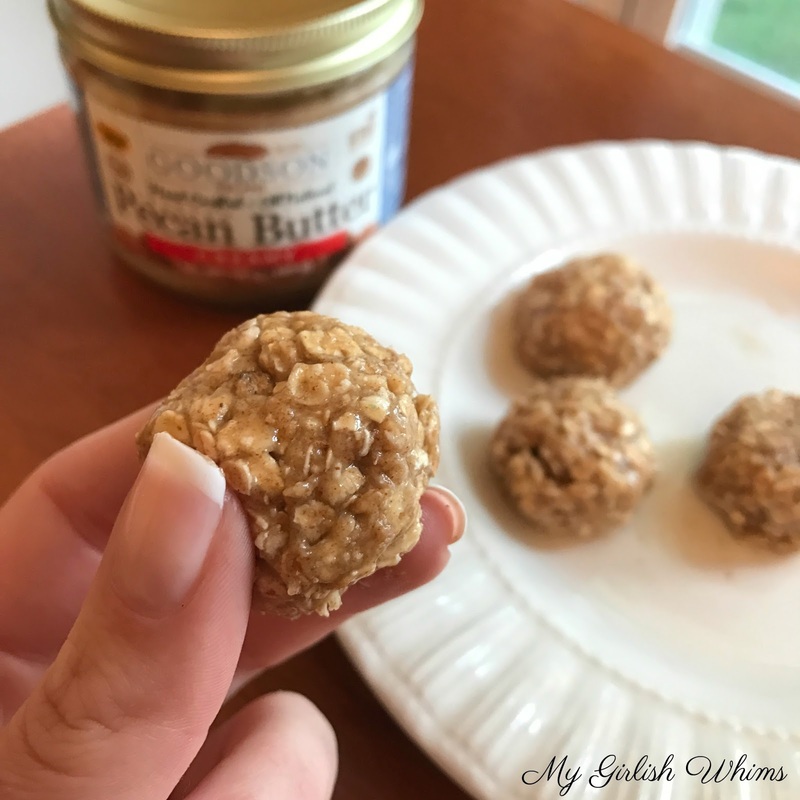 Pecan butter protein balls come together in only five minutes and are a delicious portable protein snack! IT IS NICE GAME DOWNLOAD HERE. Thank you so much for this wonderful recipe. I ordered all the ingredients and have a question about the nutrition. Can you please give me the nutrition numbers for the pecan butter, it's not on the jar. Thanks! Goodson was able to get back to me. According to their label, 2 Tbsp of pecan butter is 210 calories. Your single serving recipe calls for 1/4 cup (or 4 Tbl). This would mean the pecan butter alone is 420 calories for one recipe. Am I missing something? I must not be understanding something for their to be such a discrepancy. Thanks in advance for clarifying.